← Is a £12bn welfare cut achievable? Only with a big pay rise! [W]e ‘know’ there might be a threshold for sovereign debt, but it varies over time and across countries, it’s a correlation whose causal direction and mechanism is unclear, and there isn’t enough data for any estimates to be robust (because history only runs once). All of which only goes to underline how little is known about the macroeconomy, not to mention how hard any macroeconomists and their camp followers find it to resist claiming certainty where there is none. No doubt Reinhardt and Rogoff were tempted into over-claiming for their work by the politicisation of the debt threshold issue. But the underlying message of their big 2009 book, This Time is Different, is unscathed: unlike the later paper, it makes it absolutely clear that debt ‘thresholds’ above which increasing borrowing is correlated with lower growth vary widely in different countries and at different times (no magic 90% here); and that the historical record indicates it generally takes a long time for growth to recover after banking crises involving debt overhangs. In short, there comes a point at which public debt damages the economy but that point will be different for different countries, depending on their circumstances at the time. It’s difficult to work out where that point might be but economists from the IMF published a report earlier this week which attempts to do just that. They have estimated the amount of fiscal space each country has, that is, the amount in percentage points of GDP by which a country can safely increase its debt. For example, if we add these figures to the IMF’s debt estimates, the UK could increase its debt to around 220 percent of GDP, Germany to 240 percent and the US to 270 percent before they would run into problems. On the other hand, Japan at 246 percent, Italy at 132 percent and Greece at 177 percent, are already at their debt-to-GDP limits. Debt sustainability, then, is not just about the debt relative to GDP. There are a lot of other factors which contribute to how much debt an economy can stand. It’s different for different countries at different times. 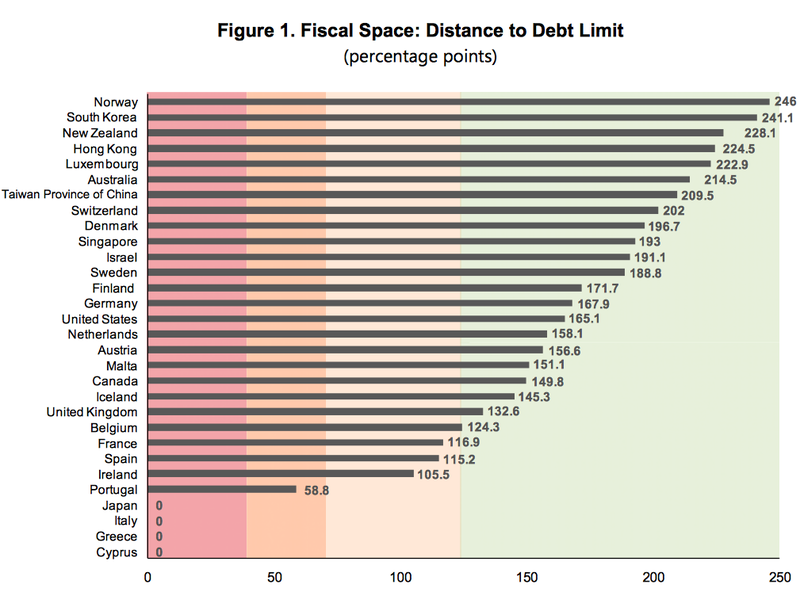 The report’s authors argue that those countries in the safe zone (the green area on the chart) don’t need to worry too much about reducing their debts because they have a lot of fiscal space to play with. Furthermore, attempting to pay off debt when they don’t need to could do more harm than good. Where countries retain ample fiscal space, governments should not pursue policies aimed at paying down the debt, instead allowing the debt ratio to decline through growth and “opportunistic” revenues, living with the debt otherwise. The reason is that the deadweight loss associated with inherited public debt represents a sunk cost— so, abstracting from rollover risk, there is little purpose in paying it down by raising taxes or cutting productive government spending (of course if there is scope to cut unproductive spending this should be pursued). Distorting your economy to deliberately pay down the debt only adds to the burden of the debt, rather than reducing it. [I]t does not follow that once the debt has been accumulated, it should be paid down to restore growth. On the contrary, where countries retain ample fiscal space, the cure would seem to be worse than the disease—the taxation needed to pay down the debt will be more harmful to growth than living with the debt, and the reduction in sovereign risk that would ensue is likely to be smaller than the distortive cost involved in paying down the debt. In short, then, those countries in the green zone don’t need to panic about debt just yet. For those countries with no headroom (in the red or amber zone on the chart), the IMF’s paper is not much use: they need to take action to reduce their borrowing levels. But for countries well into the green zone (of which America is a star performer and Britain is a somewhat marginal case), the IMF’s analysis has a clear message: don’t worry about your debt. For these countries, the wonks argue that the costs of raising taxes or cutting useful spending to reduce debt levels outweighs any benefits. For countries safely in the green zone, the authors present an example of a country reducing its debt from 120% to 100% of GDP. They calculate that the expected costs of the higher taxation (for instance, from the disincentives to work created by increased tax rates) are likely to outweigh the expected benefits (from the lower risk of a default in the event of a crisis) by a factor of ten. What should such countries do instead? The best thing, the paper says, is simply to let economic growth take its course. In the long run, if the economy grows more quickly than debt, the burden of it will fall as a percentage of GDP. For those that can afford to, then, it’s better to let economic growth do the job of reducing debt (as we have done in the past) than to subject ourselves to unnecessary austerity. The simplifications do not mean that the IMF researchers’ conclusions are wrong. The biases go both ways. Acknowledging their circularity points towards paying down debt faster than they allow; including the demand side points towards even more caution against paying down debt. On balance, the advice is probably often right. And simply pointing out conditions under which paying down debt is more harmful than the damage caused the debt itself is a useful corrective to much of the debate. Does government debt matter? Yes but the UK is still a long way from the point at which it becomes a serious problem. We are not, and never were, anywhere near to being like Greece (yes, people are still peddling that one) and it doesn’t make sense to act as though we are in some sort of crisis. Even the OECD has advised the government to ease off on its planned spending cuts on the grounds that they will damage growth. Is another round of austerity really necessary or is it just another vanity project? 12 Responses to How big a problem is the UK’s public debt? It is motivated by an ideological commitment to small government: reducing debt is a justification for reducing expenditure, not a motivation. It’s worth noting that this report basically debunks Diane Coyle’s stance. When questioned at the time she said “a sampling of the literature clearly indicates…” – when in fact, the literature indicated no such thing. When you look at R&R’s book, it’s a specious cherry-picking of incidents with no reference to political factors whatsoever. Us MMTers claim it is no problem at all. The only “fiscal space” for a currency issuing government is real resources. On Greece, there is a big difference between currency users and issuers. Rick, have you seen the data on Japan? 200%+ public debt, no problem. But regardless, if you look at the sectoral balances, the govts strategy is ever greater household debt, which is much more unsustainable however you look at it. In fact, “Japan is now paying the lowest long-term interest rates in recorded economic history (dating back to the Babylonian Empire, in fact)”. That was 2012. And yields have only got lower since. Astonishing. There is no fiscal crisis in Japan, Japan still has plenty of room to increase its debt. In fact, going by demographic issues related to secular stagnation, it may need to increase debt permanently. An irrelevant technical issue being used by far right tory party to justify its pro rich agenda. I can’t quite remember but wasn’t R n R about external debt in foreign currency?